Goodson Associates is committed to the continual development of its I.T. system and an ongoing programme of training for its staff to ensure that it remains fully conversant with this constantly changing sector of the industry. All of our drawing production is carried out using AutoCAD, the industry standard drafting tool. 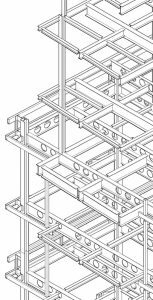 Our structural drawings are developed using Autodesk Revit Structure, a 3D modelling software which can be combined with the architect’s and M & E engineer’s models to enable BIM (Building Information Modelling). Our drafting systems also support additional software packages such as Autodesk Multisuite which permits the direct detailing and scheduling of reinforced concrete. Our civils designs and drawings are carried out using Autocad Civils 3D. This allows us to develop the design in 3d. This includes roads and earthworks for a proposed development, site levelling, carparking or high level site appraisal. The drainage design is integrated with AutoCAD Civils 3D using the Microdrainage drainage design software package. Our engineering staff use the latest versions of structural analysis programmes such as CSC Fastrak, Portal Frame, Multi-storey Building and S-Frame to enable the efficient design of structural elements or entire frames in concrete, structural steel or other common construction materials.